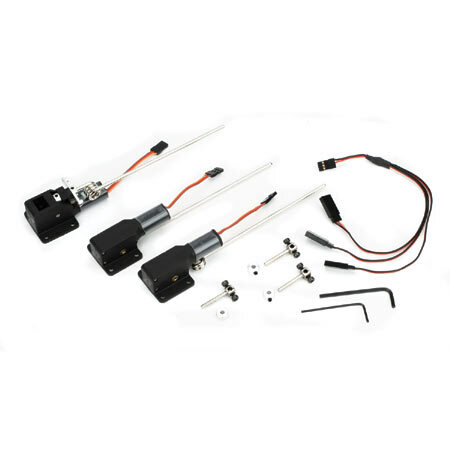 15 - 25 Tricycle Electric Retracts Key Features Robust landing gear strut and mounting bracket Integrated electric motor with a micro PCB Built-in overcurrent protection Strut Diameter: 0.137 in (3.5mm) Aircraft Weight: 4.00 - 7.00 lb (1.80 - 3.10kg) Overview Add the realism of functioning retracts to your 15- to 25-sized airplanes. E-flite's completely self-contained retract systems require no air tanks, complex linkages, or even extra servos. They simply need to be bolted into place and plugged into the receiver. A specially designed Y-harness is also included, allowing pilots to use a single receiver channel to control all retract units.